Apple will streamline the App Store purchasing experience when iOS 6 arrives this fall, as noticed by Reddit submitter Varmanj. In two significant changes, Apple will no longer require that users enter passwords to download free apps, nor when users download an update to an existing purchased app, whether paid or free. In iOS 5, users must enter their password whenever they wish to download an app, whether paid or free, and every time they wish to download an update. In iOS 6, upon pressing the 'Free' button on the App Store, the button changes to "Install App" and another press begins the install process. In another change designed to make the purchasing process quicker and easier, the App Store no longer returns users to the home screen when an app is purchased. Instead, it downloads in the background, making the purchase of multiple apps much easier. Apple still requires passwords for apps that cost money, and for in-app purchases -- though the 15-minute grace period allowing users to purchase multiple apps after entering the password once still applies. Update: Apple appears to have reversed this change. When downloading a new free app, Apple now requires users enter their Apple ID password again before proceeding. Installation of apps should still be behind a password. You don't want your kids installing something you don't want on there, even if it is free. but wasnt that already posted a while ago? ... which looks like the desktop iTunes store. Why didn't you think of that? Can't you see it's borrowed from the desktop iTunes store? Don't immediately jump to the android conclusion. This isn't new! Is it a slow day in the office or something?? This is a welcome change, however, I hope they put the granular control in the parental controls. I'd love to be able to let my kids update their own apps, but I don't want them installing any old free app. Judging from Apple's parental control track record though, I'm sure it will still be just "allow them to install apps" or "don't allow them to install apps." The all or nothing approach to parental controls on iPods has been one of my biggest complaints about iOS. Considering how popular iPods and iPhones are with kids, you would think Apple would have improved the parental controls to at least give you more than the bare minimum options it has now. maybe you should be parenting them instead of apple. Déjà vu? Ah, no it's just macrumors re-running stories. When the page loaded my first thought was "why is there a picture of the android app store?" Other than it's grey it still looks pretty much like iOS 5's app store. Proven fact: Lighter colors tend to make people happier. 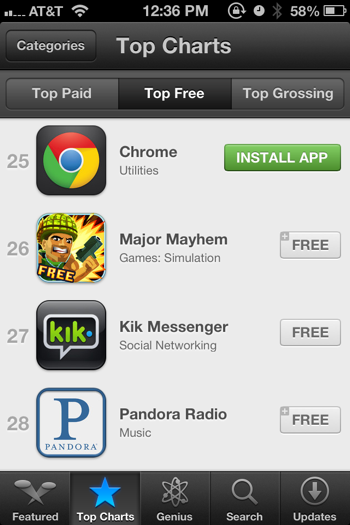 Perhaps the black app store isn't such a good idea. I have a child and this makes no sense to me. I parent my child and he knows to "ask me" if he can download an app to my iPhone when he is using it for those times I allow him for long car rides. He would never just start installing something without asking me. I don't need Apple to police my personal phone. Yes I can restrict his iPod touch for those times I'm not there but overall there is an understanding that apps cost money, space and not all apps/games are age appropriate so even if it's free he needs to ask first.